We Help Leaders, and Leadership Teams, get feedback that really matters! Every year we help dozens of intact leadership teams to understand and explore their emotional intelligence, create strategies for development, and increase their emotional effectiveness. 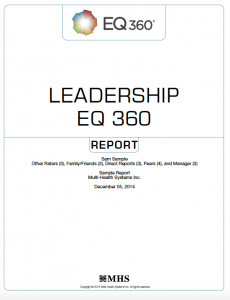 The EQ360 is the leading trait based emotional intelligence assessment available. Based on the scientifically validated, EQ-i Self Assessment tool, the EQ360 offers the ability to collect feedback across 5 separate rater groups, as well as 5 free text questions that can be used to drill down further into key areas of relevance for the leader. Our proven and well-established process results in the highest level of rater participation, maintains confidentiality, and ensures that leader’s get the highest quality feedback possible. After data collection, we use our proprietary EQ 1-2-3 development process, to work side-by-side with leaders to start, and then sustain, their emotional intelligence development. Partnered with our innovative learning programs delivered in-person or online, and our Daily Practice reinforcement programs, our EQ360 based feedback programs are simply one of the most effective ways to increase a leader’s overall emotional effectiveness. Whether you want to provide EQ360 feedback for just one leader, an intact team, or layers of leadership within the organization, we can support you from start to finish. Contact us today and find out why we are one of the leading providers of EQ360 based feedback programs in North America.